As we continued our March through Chicago, about 1/3 of the way through our Milwaukee Ave segment we made two stops. The first was at The Map Room for a beer. The second was at Redhot Ranch for a hot dog. 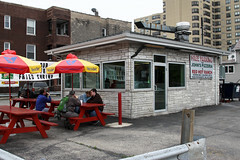 I’ve always had a like for Chicago-style Hot Dogs, and you can read my writeup of several notable Chicago dog places here. 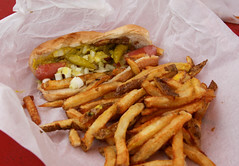 While there’s definitely some difference between different vendors, there’s a widely-respected view that a proper Chicago Dog has some basic requirements: A Vienna Beef hot dog (preferably of the 6 per lb ‘Jumbo’ variety, with natural casings), celery salt, onion, that neon-green relish, tomatoes, a pickle, and, most importantly, sport peppers. Most any place that’s serving up a proper Chicago dog serves it up with exactly those ingredients, and as a result, there’s not a lot of difference between one place’s Chicago dog and another’s (mostly, the difference whether the dog is a char dog or not, and how carefully it’s assembled). But that’s actually talking about the “proper” Chicago dog, and it’s important to mention that a few places focus on a slightly more pedestrian variant of the Chicago dog: the “Depression Dog”. Redhot Ranch is one of these places (as are a few others, including the well-respected Jimmy’s Red Hots and Gene’s and Jude’s, both of which are worth a writeup during some future visit). The Depression Dog is basically an older, simpler variant of the Chicago Dog. The hot dog itself is still a true Vienna Beef frank, but you’ll seldom see a proper Depression Dog with jumbo franks, instead, it’s usually the more common 8 per lb variety of the Vienna beef. And just like the dog itself being scaled back, the rest of it is downplayed as well. The bun is a standard bun, and not the poppy seed variety (this, in particular, is a blessing for me, since it takes very few poppy seeds to give me pounding headaches for the rest of the day). And the condiments list has been reduced as well, being served up with just mustard, onion, relish, and sport peppers. No dragging it through the garden here, there’s no pickle. And no tomato. But they’ve kept the essence (IMHO) of the Chicago Dog: the sport pepper. In any case, that’s what Redhot Ranch serves. The menu is pretty simple: they basically offer up a hot dog with fries, a double dog with fries, a polish with fries, and french fried shrimp. We all ordered up hot dogs, with a variety of toppings, but I went for everything (gotta have my sport peppers!). Redhot serves up the hot dog and fries as a combined unit: the hot dog is assembled and topped, the fries are tossed on top of it (almost like another topping), and the whole mess is wrapped up and handed to you. How was the hot dog? Well, as I mentioned above, there’s enough standardization with Chicago hot dogs that it’s hard to really impress me, but Redhot did as expected with the dog and didn’t mess anything up. A good Vienna beef dog with natural casings (so they aren’t foisting off dogs that are off-brand, or skinless), still having a bit of “snap” from the casing, served up with a decent amount of condiments (neither stingy, nor burying the dog in an excess of mustard and relish like some places), this was a decent Depression Dog. But where Redhot shined was the fries. My usual experience with Chicago Dog places is that the fries are either an afterthought (I’ve had no end of places serve me limp, stale, and greasy fries…I’m talking to you, Jimmy’s Red Hots), or just aren’t the style I like (I’m thinking of Superdawg’s crinkle-cut Superfries here, which never have the right crispness for my taste), and that they usually throw off the general balance of the meal. A lot of places (Redhot Ranch amongst them) treat the dog and fries as an atomic combo, meaning that if I want extra dogs, I’ve got to get extra (often lifeless) fries to go with it, and it frustrates me, since I like to save my limited stomach space for the stuff I enjoy. 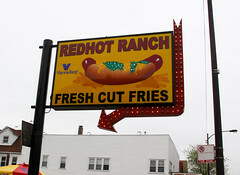 But Redhot Ranch solves this, not by decoupling the hot dog from the fries, but by actually serving fries that are good. Hand-cut, fresh French fries, served up just starting to brown a bit, with a proper, crispy exterior and a fluffy interior. These were some of the best fries I’ve had in the last few months, and are definitely head-and-shoulders above the normal fries at these sort of places (although there are some other standouts out there, like Hot Doug’s duck fat fries). The result is that instead of frustrating me, Redhot’s dog and fries combo delighted me. I’ll definitely think about another trip out there if I’m in Chicago and headed out in that general direction. The only downside? Redhot Ranch is one of those places where I find out after the meal that I missed a great opportunity. Apparently, the fried shrimp at Redhot are excellent, and worth seeking out. I’ve got them on my list for a repeat visit for exactly that reason.